CardCruncher Reviews - Choose The Best Credit Card? CardCruncher uses your transaction history to formulate a list of the cash back credit cards that will provide the most rewards. It is a good fit for cardholders who don’t pay late or carry balances. CardCruncher is a free credit card recommendation site that looks at your credit card transactions from the past two years and provides recommendations for cash rewards credit cards. The site’s goal is to show you which cards will earn the most rewards per year and let you make a decision based on those numbers. The company was founded in October 2017 and launched the inaugural version of the service in March 2018. The company has two founders: former NerdWallet credit card expert Kevin Cash and a silent partner with experience in the financial world. To prepare for this review, we were able to talk with Cash about why the company started. He told us that, during his time at NerdWallet, he spent a lot of time writing about credit cards. He also had family and friends asking him which cards are best. While the question sounds easy, the answer, especially when it comes to cash rewards credit cards, is tough. You have to know how much you spend in various categories like groceries, gas and restaurants to know which cards provide the best rewards. So, Cash said, he joined forces with his silent partner to create a site that looks through your transactions and the categories of purchases you market to formulate a list featuring the best cash rewards cards for your spending habits. Does CardCruncher provide accurate suggestions? How do they get your financial information and is it secure? How does it compare to Birch, a similar service that helps you maximize rewards? These are the three main questions we’re going to answer in this review. We’ll conclude with a quick section on the service’s pros and cons. How Does CardCruncher Works and How Accurate Are Its Suggestions? To understand how the site works, we signed up for an account, which took all of a few seconds. We connected one of our bank accounts and soon after CardCruncher gave us a list of 90 credit cards ranked from the card that earned us the most cash rewards per year to the one that provided the least amount of rewards. Each credit card result provides you the card’s “Crunch Value”, which is what you’d earn each year after you subtract the card’s annual fee from the rewards you get from your spending and from any sign-up bonuses the card offers. The Alliant Cashback card the site recommended has a yearly cash-back total of $1,275 based on our spending and, minus the $59 annual fee, provides a Crunch Value of $1,223. The Bank of America Premium Rewards is a good example of a card whose rewards calculations include total rewards ($790), bonus rewards ($500) and an annual fee ($95) for total yearly rewards of $1,195. If you like the card or cards they recommend, you can click on the card’s “Apply Now” button and you’ll be sent to the card’s application page. Pro tip: CardCruncher focuses on the past year of transactions to make recommendations, but they can go back as far as two years. We believe this feature of the site is a great tool to help you understand how cash rewards credit cards work and why one card is a better choice for your spending than another. In our conversation with Cash, he pointed out that the site’s goal is to provide you a recommendation based on a cash reward’s cards rewards rate. The reason this is important is that it means that certain factors are not included in their card recommendations. For example, if you’re someone who has a habit of paying late and carrying a balance, the Bank of America Premium Rewards card may not be the best fit because it will hit you with a penalty APR of 29.99% that could cost you hundreds of dollars in interest payments over the course of the year. Also, we noticed a few inconsistencies in the way they valued each card, something that’s not out of the ordinary for a new service like this. The Alliant card has a $59 annual fee, but it’s waived the first year, something that wasn’t factored into the card’s valuation. Also, the card’s rewards rate of 2.5% is 3% for the first year, a bonus that should be included in the rewards calculation. As we said, these kinds of small quirks are typical with a new site like this. However, it’s important to read over the card’s features before applying. In many cases – Alliant Cashback included – the “Apply Now” button will take you to a page that includes information about the cards rates and fees. Editor’s note: The B of A Premium Rewards card’s value was missing up to $200 in travel credits the card provides. CardCruncher told us the calculation should have included travel rewards and that they would forward the mistake to their developer to fix the error. While CardCruncher doesn’t actually tell you how much you will earn after your first year, it’s simple. Just subtract the bonus amount from the Crunch Value. You may find that subtracting the bonus may put a card’s cash rewards value farther down the list and boost other cards, so keep this in mind if you’re looking for a card to last you more than one year. In addition to the factors listed above, remember that CardCruncher isn’t designed to be a comprehensive analytical tool that factors in multiple variables both in your finances and the credit cards it recommends. It’s meant to be a straightforward tool to answer one question: Which card gets me the most cash back in year one? We’ll explain why this is important when we move into the final section of this review. CardCruncher uses a popular company named Plaid to keep your private information safe when you log into the site and connect your bank accounts. Basically, when you log in to your financial institution, Plaid is accessing your banking information and categorizing it, then sending all that info to CardCruncher in an encrypted token that’s used once to calculate which cards are best for you. As the company’s site notes, Plaid is also used by Venmo, Coinbase, Transferwise. Birch is a fintech company that offers a somewhat similar service as CardCrunch. Basically, you provide Birch access to your credit card accounts and they’ll let you know, on a transaction-by-transaction basis, which of your credit cards could’ve been used to get the most rewards points. Birch also provides additional financial tools and credit card recommendations. We see this app as being something that takes a fine-toothed comb to your transactions and does a transaction-by-transaction recommendation for which rewards card is best. However, those recommendations are pulled from the cards you already have. 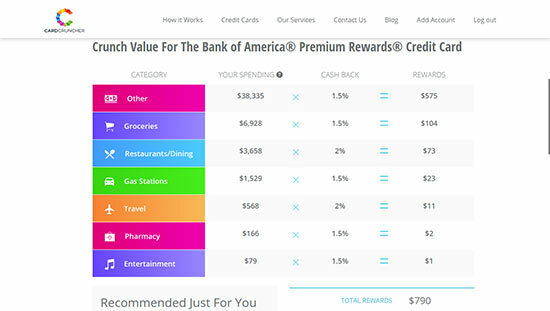 CardCruncher makes recommendations for credit cards based on overall spending patterns in specific categories. Also, their recommendations are limited to cash back cards, whereas Birch will provide recommendations for any type of rewards card you’ve connected to their service. In general, we believe Birch is the better choice if you want a detailed analysis of your rewards spending and an in-depth journey into the world of credit card rewards. CardCruncher, on the other hand, is a perfect tool if you want a quick recommendation based on your unique spending patterns. Based on our research, we believe CardCruncher’s greatest strength is in its simplicity. It’s designed to answer one question: Which cash rewards card can get me the most money. Their site is able to formulate a recommendation list specific to your spending in the past year and provide you links to sign up for the card. 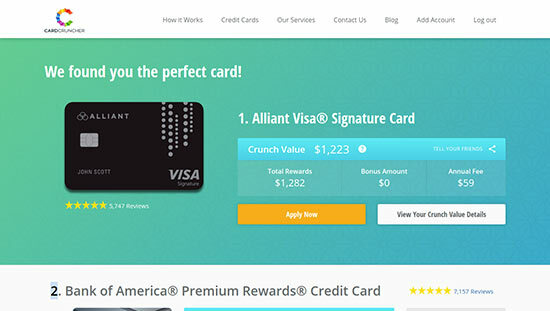 If you don’t want to put much thought into which cash back card is best for you, then this site is arguably the easiest way for you to get a lucrative cash rewards card. We believe the site’s downside is that the results aren’t nuanced to things like your frequency of late payments, propensity for carrying a balance or 0% interest offers that could help you manage your debt. These factors make the “best card” choice a little harder because you have to factor in late fees, penalty APR’s and regular APR’s. Based on everything we’ve discovered about this site, we believe it’s the perfect fit for someone who doesn’t carry balances, always pays on time and wants the simplest way possible to find out which cash rewards cards is the best fit for their spending habits. If you tend to deal with late payments and you carry a balance, then the best cash back rewards card will be the one that combines a low APR, no penalty APR and substantial cash rewards. Should you find yourself in this category of cardholders, take a few minutes to read through our guide to the best cash back rewards cards of 2018. In the guide, we help you see which cards are best for specific situations, including the best overall and the best for those who pay late. Write a Review for CardCruncher!